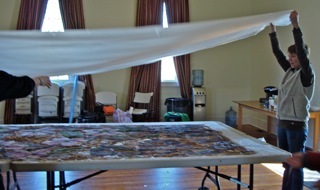 Now the work begins. 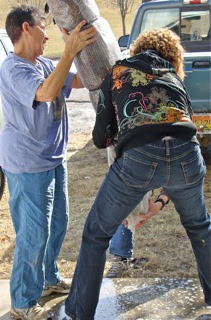 Roz Houseknecht and Dalis Davidson carry the rolled and tied wool on tulle piece outside and drain off the excess water. 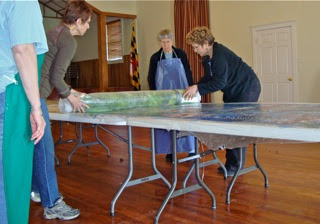 Roz, along with Paige Garber, Bev Thoms and Sharon Janda begin rolling the wrapped log back and forth with their feet. 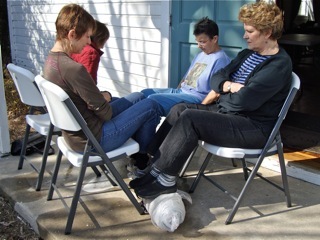 The roll is reversed and rolled in the opposite direction. 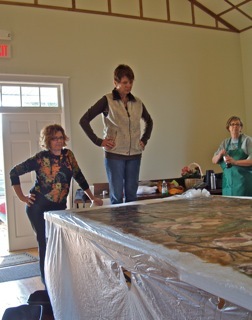 After a spate of rolling, the log is carried back inside and unrolled on the set of tables. 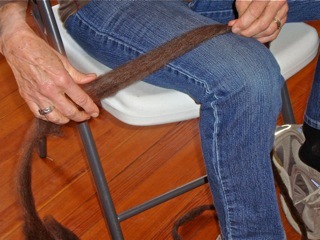 The design is checked for shifting and tweaked back into position. 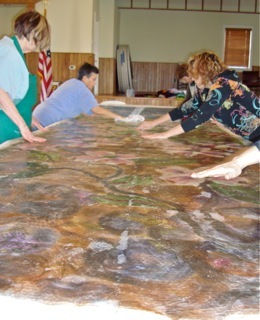 Dry spots are rewetted. 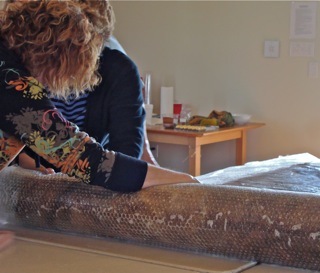 It is recovered with the plastic sheeting and rerolled into a log starting from the opposite end and retied. 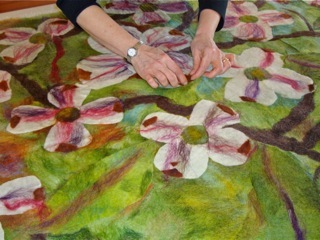 More rolling to continue the felting process. 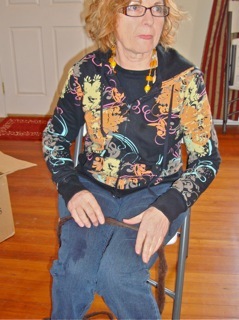 This will be repeated several times. 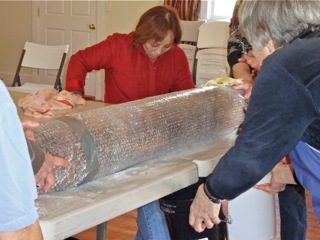 The roll containing the Spring panel is wrapped in black plastic garbage bags for transportation home where rolling will be continued until the wool is totally adhered to the tulle backing and to itself. 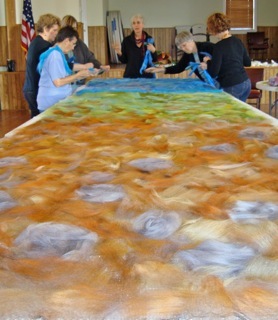 At this point the process of fulling will begin where the panel is beaten and thrown to encourage the wool to draw up and shrink. 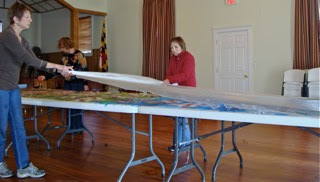 The 19-20 foot long original size will end up 15 feet or less. 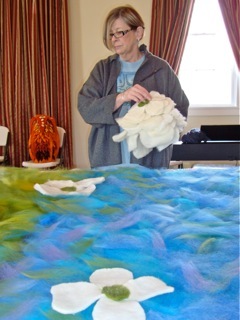 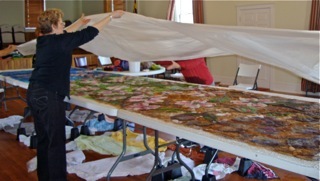 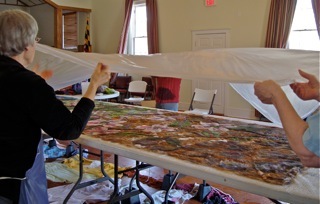 Come see the finished 4 seasons panels at the Saville Gallery in Cumberland, MD March 10- April 2 along with many individual examples of felted work. 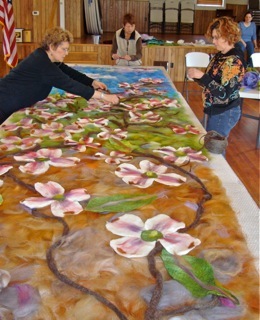 Roz Houseknecht, Paige Garber and Bev Thoms assist Dalis in placing the branches. 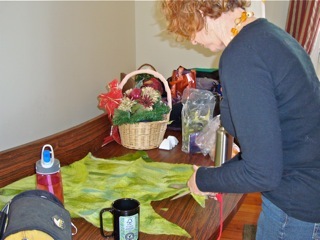 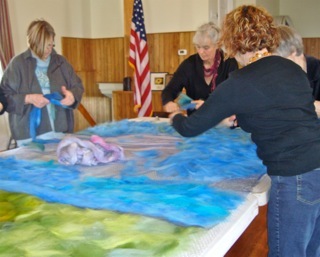 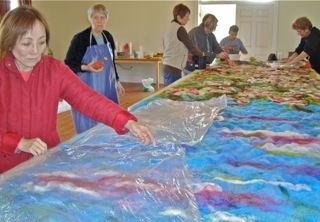 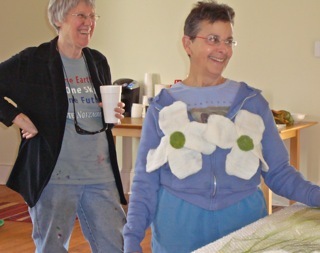 When the placement of branches is complete, Dalis and Roz pat down the layers of wool while Bev adds color to the clouds. 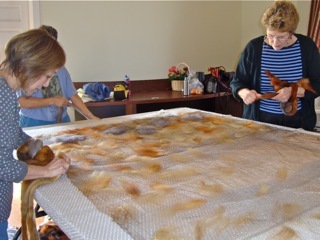 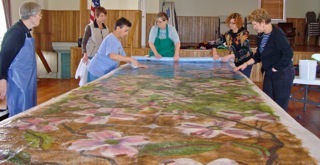 Sharon Janda, Roz Houseknecht and Bev Thoms begins spraying cool, lightly soapy water onto the panel. 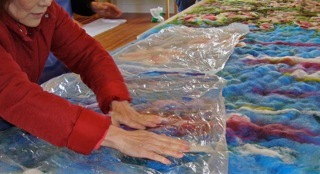 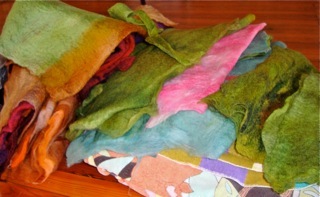 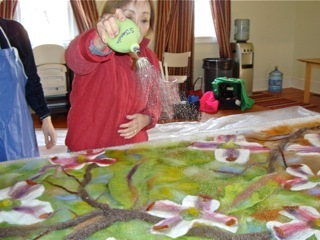 When felting wool onto a finely woven background that is not wool, beginning with cool water slows the felting process so that the wool fibers have time to migrate into the brackground before felting to each other. 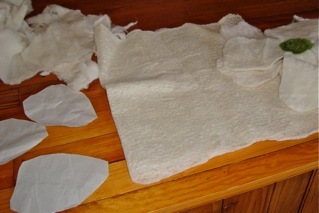 When the wool is thoroughly wetted, the panel is patted down again using plastic to prevent the wet wool from sticking to hands. 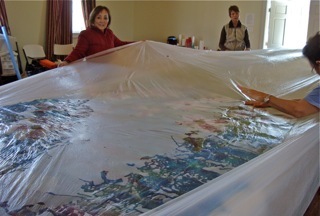 The wetted panel is covered by a large single piece of plastic. 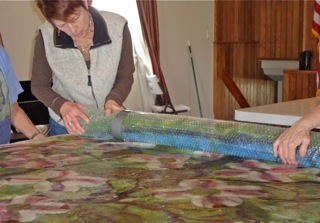 The plastic is smoothed down eliminating air bubbles. 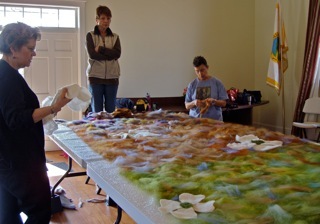 Bev, Dalis and Zita Simutis check the panel for last minute adjustments. 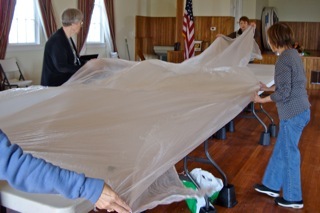 Dalis and Jeanne Bohlen cut off the excess plastic sheeting. 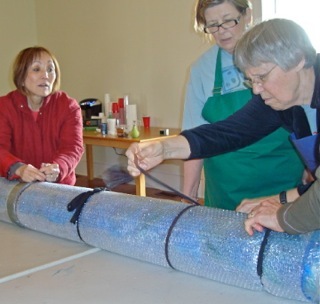 Using a swim pool noodle for a core, Zita and Dalis begin rolling the panel up into a log. 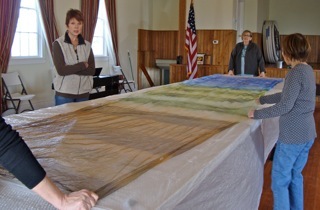 It takes a lot of hands to smooth the panel so that the rolling is consistent. 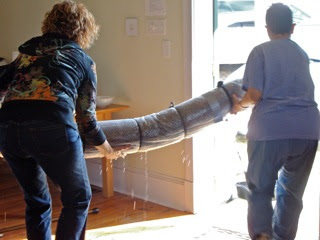 Excess water is squeezed out and mopped up along the way. 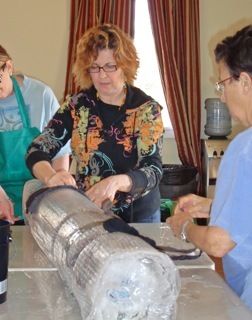 The roll is tied with nylon stockings. 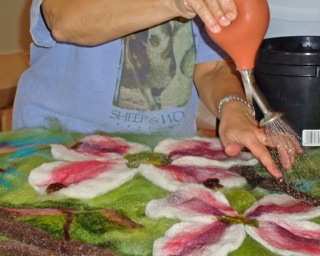 While beadwork is my primary love, I also work in other fiber media including embroidery, both hand and machine, as well as knitting and felting. 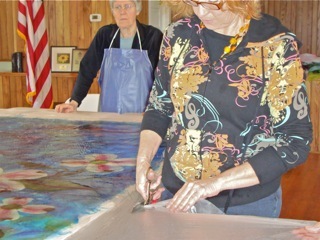 Allegheny’s Arts Council’s Saville Gallery in Cumberland Maryland. 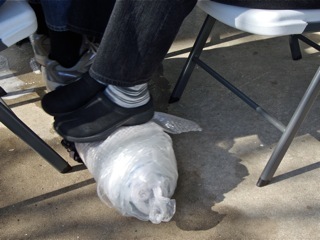 Saturday, 12 March. 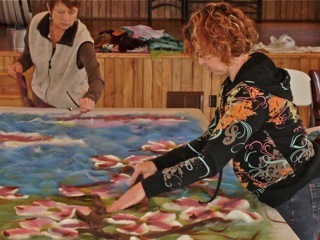 The show runs from 10 March until 2 April 2011. 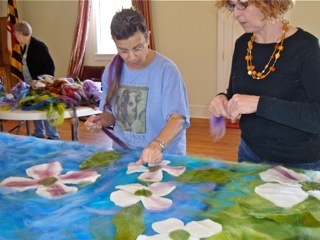 While each of us will have individual works of art on display, including felted wall pieces, clothing, sculptures, scarves, hats, purses and jewelry, we are also creating a large installation piece specifically for this exhibition. 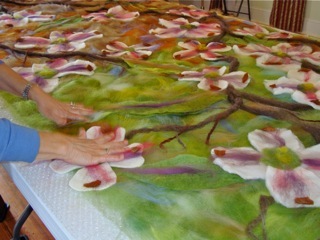 It will consists of 4 floor to ceiling panels following the branches of a dogwood tree through the four seasons. 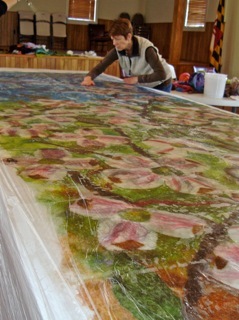 Yesterday we met and laid out the final piece in the series: Spring. 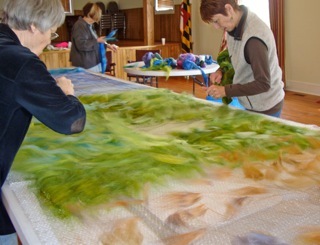 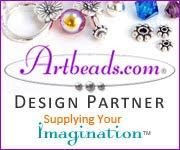 I thought that I would digress from beadwork and follow the creation of this major piece. 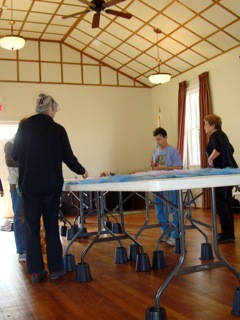 First, 6 tables are arranged and raised to working height on bed risers. 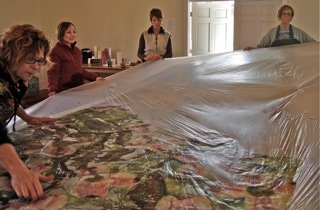 The tables are covered by plastic and then bubble wrap. 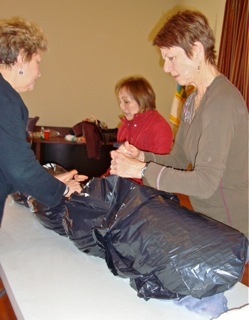 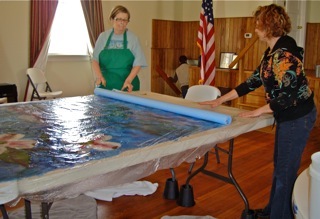 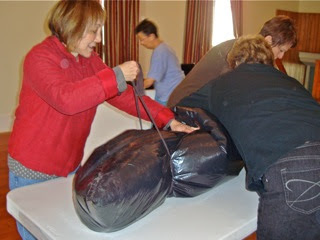 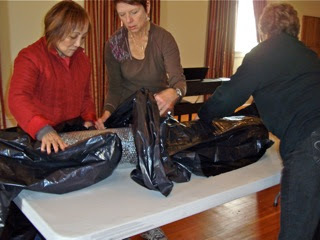 Jeanne Bohlen, Sharon Janda, Zita Simutis and Bev Thoms stretch out the plastic. 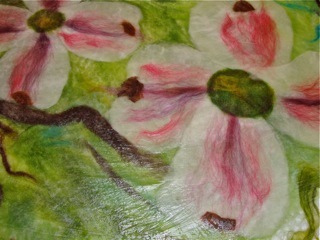 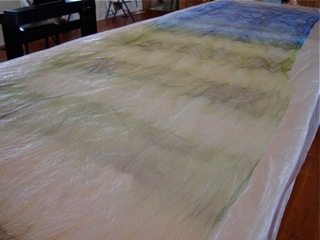 A piece of tulle predyed with ground, grass, and sky areas is places on the plastic. 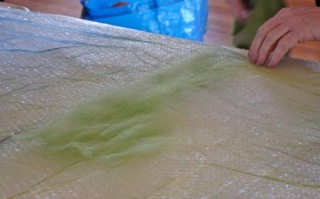 The tulle is 19-20 feet long and about 3-4 feet wide. 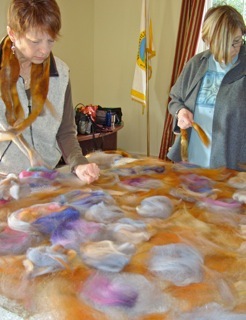 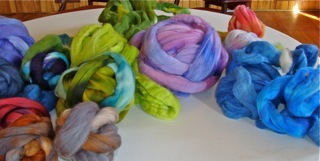 Hand dyed wool roving to be used in the panel. 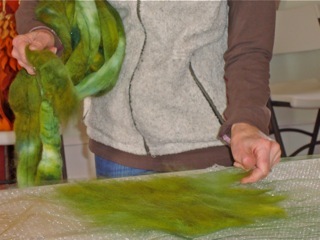 Wool is a fiber with scales that can be made to open up and attach to each other producing a fiber mat called felt. 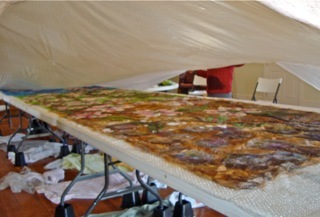 Thin layers of wool may also be made to penetrate and attach to fine openweave fabrics such as the background tulle used here. 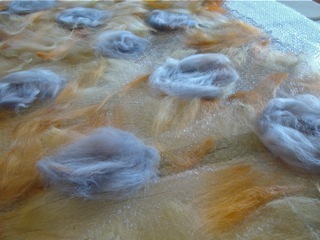 This is referred to as nuno felt. 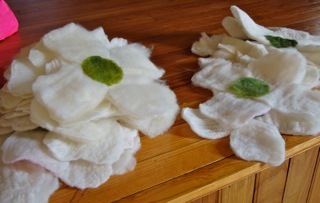 White wool has been slightly felted (called prefelt) from which the dogwood petals are cut and attached together by pricking with special barbed needles. 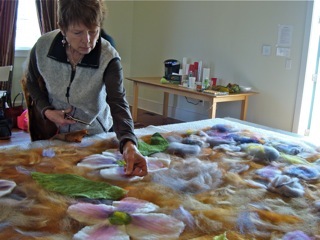 This is called needle felting. 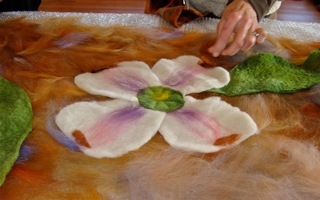 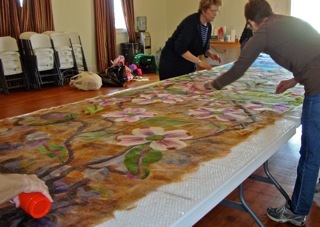 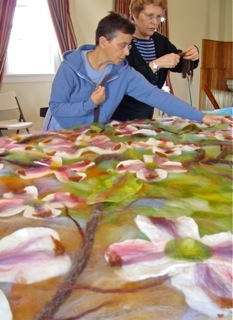 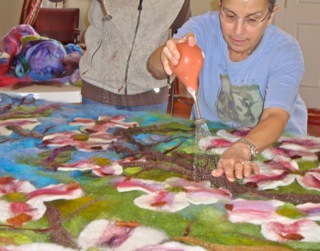 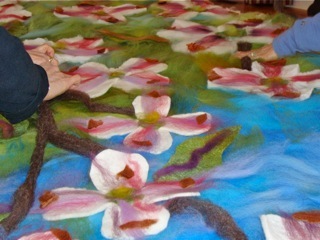 The needle felted flowers are placed on the background. 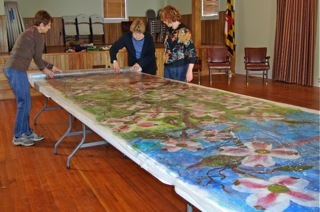 We thank the Barnesville, MD Town Hall for allowing us this wonderful space to work in.